We know that emergencies can be a stressful time for you and your horse. We will do our best to make your emergency as easy as possible. We are available by phone for new and established clients seven days a week. 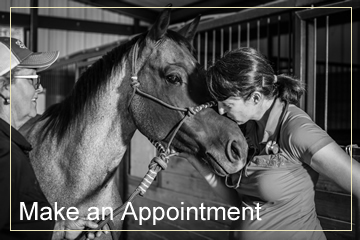 We refer to your nearest referral equine hospital if you have an emergency that requires more than primary care. Please call us at 817-609-4119 if your horse is experiencing an emergency. DJVS wants to work with you and your farrier to keep your horse sound. Complimentary consultations with your farrier are included with every lameness exam. Immediate farrier attention is also available through Jason Terrell’s Horseshoeing with over 20 years of corrective care experience.